A distraught man armed with a shotgun and threatening to harm himself holed up in a Hillcrest home Wednesday, leading to a four-hour police standoff that ended with his arrest. 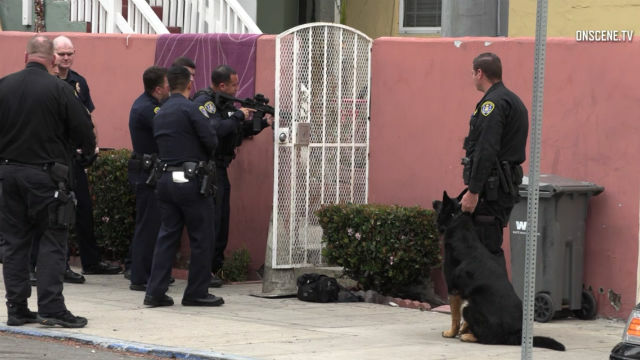 Officers went to the residence in the 400 block of Pennsylvania Avenue shortly before 8 a.m. in response to a report of a possible hostage situation, according to San Diego police. As the patrol personnel arrived, two people came out of the home and told them a suicidal 43-year-old man remained inside by himself, armed with a shotgun. “The witnesses had not been held hostage or (subjected to) any crime,” Sgt. Robert Hawkins said. Crisis negotiators were called in to try to reason with the desperate man, and police blocked off traffic lanes in the immediate area as a public- safety precaution. The man refused to surrender through the remainder of the morning. Just after noon, seeing no progress in the negotiations, police used rubber bullets, tear-gas balls and a service dog to subdue him. Officers were then able to safely take him into custody. Medics took the man, whose name was withheld, to Scripps Mercy Hospital for medical and psychological evaluations, Hawkins said.